We were planning for a cross-country car trip with out vegan daughter when I first made these tasty cookies. It’s often difficult for her to pick up snacks when we’re grabbing a hot dog from a gas station shop, so I was determined to pack some delicious and nutritious goodies for her. 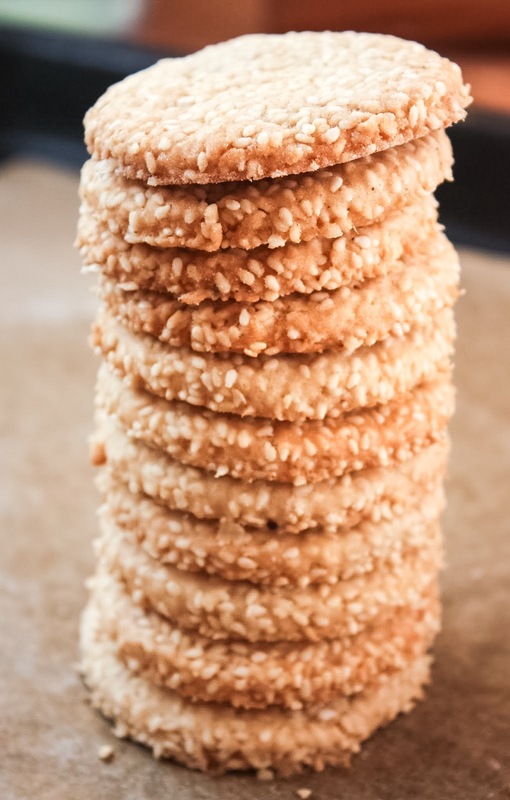 These vegan sesame seed cookies hit the mark on both counts! One of the other goodies I made for her called for toasted sesame seeds. I had toasted a pan full of sesame seeds when I made the vegan snack bites. I was keeping my eyes open for a recipe that might use up the rest. They happily became vegan cookies – adding to our road snacks for our trip with Lisa. The recipe is from Food Bridge – bridging cultures through food. This cookie is one of the pastries made for an Israeli – Moroccan henna ceremony. It’s an interesting read. Since I was just using up sesame seeds, I had to scale down the recipe, but this is a cookie where you’ll want to make more! It’s not a case of saying this tastes good for a vegan recipe; we all loved them. 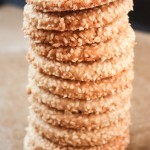 The texture was both crisp and chewy and the sesame flavor was mouth watering! I love anything with sesame. These cookies look fantastic! I just came across a forgotten jar of toasted sesame seeds in the pantry. I know exactly what I’m going to do with them. The vegan snacks you’ve made look delicious. Chris – I’m so glad you enjoyed them! These cookies are fantastic. I made them for a vegan friend but my family and I ate almost all of them and I had to make more. The only change I made was that I used orange juice where it called for water in the recipe. Thank you so much for a great recipe. Sounds like a great substitution! I can no longer access this recipe. Is there anyway you can send it to me please. Thanks! My recipe plug in has gone wonky. I’ll correct it later today. I made it and served it with cheese cubed with toothpicks and it was gone very quickly and people asked for the recipe.